I rode a quick 19 miles recently, and it was drizzling a bit as I headed out the door. This always reminds me of ‘The Rules,’ from the sometimes-crude, always-amusing and often spot-on cycling guidelines espoused at the Velominati website. 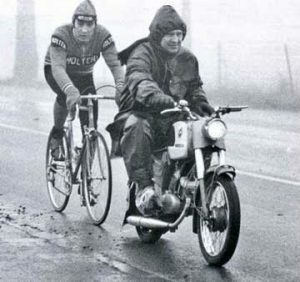 Rule #9 states something along the lines that those who ride in foul weather are badass, with a link that clicks through to Merckx motorpacing in a presumably cold rain. This is true, and it’s something we need to be reminded of now and then. Such was the case a few Sunday’s ago on the day of the Sourlands Semi-Classic. It’s always a crap shoot what kind of weather a spring classic will have — gorgeous 55 degrees with sun at the start is ideal, cold rain and 42 degrees is daunting but manageable, and sometimes there’s a big enough snow to make the ride impossible. I knew a few days out that this year’s ride would be cool and moist. I was hoping for high 40s with wet roads and dirt sections with just a bit of mud. We got temps a bit south of that and a steady rain for the first few hours of the ride. Despite that, the dirt road sections were very easily managed at speed with my fairly fat 32s. Perhaps the organizers had gotten together with whoever manages the NJ roads and picked out just the right type of gravel to use. When I pulled in to the parking lot the light drizzle I had experienced on the drive over became a nasty, heavier rain. I texted my friend who was still presumably on his way there letting him know how bad it was. I know this was weak on my part: If he had said ‘I bagged it,’ I might have never gotten out of the car and just driven home. But I got an auto-text saying he was driving so that meant he was on his way. I got out of the car, got the bike together and got registration done. The first two hours or so were in a cold rain, but it was not so bad with a rain jacket. It was a good ride and I almost didn’t do it. And once again they had soft pretzels and mustard at a rest stop, which seems to be a Kermesse Sport tradition. Love it. This ride reminded me of something I learned on a ride long ago: Very often in life, if you just get something started it will feel better soon enough and become tolerable. Whether it’s a bit of work that needs to get done or some retooling for the modern job market or a dreaded visit to the in-laws, cycling teaches us. Sport teaches us, really. Just get started: A journey of a thousand miles begins with one pedal stroke. There are so many things I have accomplished or suffered through that I owe to the physical and mental benefits of competitive cycling and just plan hard riding. When I think of what I want to give back to cycling, it’s about teaching people the value of suffering and how it makes a person stronger. Our nature and the softness of our lives today worries me. It bothers me that we don’t celebrate overcoming challenges and excellence as we once did. In the not-so-distant past life was a challenge. Sport and sporting events are a way to add something a bit more primal back in to the mix. For about six years now I’ve used the Sourlands ride and/or the famous Hell of Hunterdon as my early season benchmarks. The Hell of Hunterdon is this coming weekend, and although the ride is likely all filled up, the organizers made a late announcement just last week that they’ve added a bit of celebrity to the early packet pickup option they offer the night before the ride. Even if you couldn’t get in before registration filled up for the challenging 85 mile ride on Sunday, all are invited to come to the Elks Lodge in beautiful Blawenburg, NJ, on Saturday, March 17th, for a Q&A session with former professional cyclist and PA-native Floyd Landis. Floyd will talk about his cycling career, his life after professional cycling, and his “Floyd’s of Leadville” business, among other subjects. The event is free of charge, but donations to the Elks Lodge Charity Fund are suggested. It is also open to the public; you do NOT need to be registered for the ride in order to attend. As I write this I just received notice from Kermesse saying that the normal final instructions e-mail for the HoH ride would be delayed a day. The recent weather with downed trees and powerlines, and washed out roads, has prompted some late course corrections. Sounds like we’ll have some good challenging dirt roads Sunday!